I didn’t have any fresh ingredients for supper apart from some garlic and a packet of smoked lardons and so I made this, which, as it turned out was really, really tasty. I had it with pasta. I only used half of it as I was eating alone, and it could easily feed 3-4 people. We had run out of olive oil, so I used a small amount of butter instead. Either is fine, I would have used olive oil if I’d had it. I intend to eat the leftover sauce with a fried egg on top for breakfast. In a heavy frying pan, melt a small knob of unsalted butter or heat a tablespoon of olive oil. Add in the lardons and cook on a medium heat with a pinch of red chilli flakes and the fennel seeds. Don’t have it so hot that the bacon scorches. When it has been cooking for a few minutes, add in the sliced garlic. If you add it earlier with the bacon – it may burn. 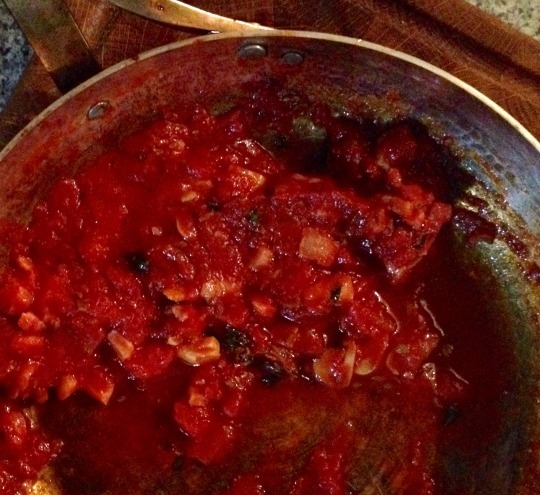 Stir and when the garlic is turning light golden brown, add in the tin of tomatoes and ½ tinful of water. Stir, and add in the vinegar. Cook for 10-15 minutes on a low bubbling heat. Then, mix in some torn up fresh basil (optional). Season with salt to taste at the end, and be aware that the bacon has already brought salt to the mix, so don’t overdo it. Meanwhile, cook your pasta in plenty of well-salted boiling water (ideally, 1litre water/100g pasta/10g salt). When the pasta is ready drain – saving 2 tablespoons of cooking water to mix into the sauce – and then mix in the sauce – however much you need.